Nicole Paduraru, for the Respondent. 1. 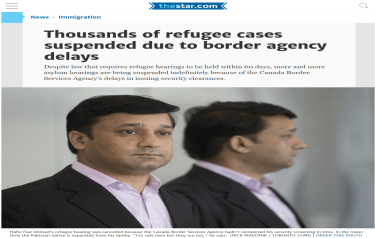 Mr Raj Kamal Clare, originally from India, became a permanent resident of Canada in 2004. However, his permanent resident status was revoked as a result of a subsequent criminal conviction in the US. After serving his sentence there, he was deported to India in 2013. 2. Mr Clare returned to Canada a few months after his deportation to India. He was found inadmissible based on his criminal conviction. He reapplied for permanent residence on humanitarian and compassionate grounds (H&C), based primarily on his relationship with his wife and stepdaughter. 3. An immigration officer considered Mr Clare’s application, including a psychological assessment indicating that Mr Clare was overcome with fear and sadness about his impending deportation. The officer also considered the emotional and financial impact on Mr Clare’s wife if he were removed from Canada. In addition, the officer noted that Mr Clare’s stepdaughter had special needs due to a developmental disorder. The officer reviewed evidence about her circumstances, but concluded that there was little information provided about the potential impact on her if Mr Clare had to leave the country. The officer dismissed Mr Clare’s application. 4. Mr Clare submits that the officer failed to provide a reasonable assessment of the best interests of his stepdaughter, the impact that his removal would have on his wife, and the significance of his criminal conviction. He asks me to quash the officer’s decision and order another officer to reconsider his application. 5. I agree with Mr Clare that the officer’s conclusion about the best interests of his stepdaughter was unreasonable, and I will allow this application for judicial review on that basis. I need not address the other issues Mr Clare put forward. 6 The sole issue, therefore, is whether the officer’s conclusion about the best interests of Mr Clare’s stepdaughter was unreasonable. 7. The officer acknowledged that Mr Clare’s stepdaughter had a developmental disorder. He accepted that she might not be able to move to India if Mr Clare was deported, and that Mr Clare played the role of a father figure to the child, even though she was not his biological daughter. However, the officer found that little information had been provided about the specifics of Mr Clare’s role. 8. The officer also considered a psychologist’s opinion that the stepdaughter would suffer if Mr Clare left Canada, but noted that there was no evidence about the nature of the impact that Mr Clare’s incarceration had had on the child. In addition, the officer pointed out that the child would continue to enjoy the love and support of her mother, Mr Clare’s wife. III. Was the officer’s conclusion unreasonable? 9. The Minister submits that the officer was alert, alive, and sensitive to the child’s best interests and reasonably addressed the relevant evidence. 10. I disagree. The officer failed to consider some important evidence about the relationship between Mr Clare and his stepdaughter. 11. The psychologist emphasized the significance of the relationship between Mr Clare and his stepdaughter, the only father she has known. Mr Clare’s wife also referred to the important role that Mr Clare plays. He spends a great deal of time with her, teaching her things that no one else has been able to impart. He assists her with her daily needs and escorts her to her medical appointments. As a result, the child’s circumstances have significantly improved, particularly in the area of verbal communication. The child is sad whenever Mr Clare is absent. 12. In my view, the officer unreasonably discounted the evidence showing the adverse impact on the best interests of a child that would result from Mr Clare’s removal from Canada. 13. The H&C officer did not provide a reasonable analysis of the evidence relating to the best interests of a child who would be affected by Mr Clare’s removal from Canada. Accordingly, I cannot conclude that the officer’s decision dismissing Mr Clare’s H&C application was reasonable. I must, therefore, allow this application for judicial review. Neither party proposed a question of general importance for me to certify, and none is stated. THIS COURT’S JUDGMENT is that the application for judicial review is allowed, and no question of general importance is stated.